The phenomenon of the calendar year and the related run of the events-personal, in India and in the world - have, therefore, been long since an occasion on my part for an intense introspection-a sort of stock-taking conversation with the soul! Around the end of every calendar year, the most pervasive - and extraordinary - feeling has often been, ‘how quickly-and so stealthily - the Time seems to pass…’ The latest example of this perception pertains to my persistent efforts for more than one and a half year to convince all those who should be interested and his innumerable admirers that the birth centenary of former Maharaja Yadvindra Singh of Patiala - born on January 7, 2013 - deserves to be celebrated for his immense services to Punjab and the nation. The tragically-bitter reality could be well understood: If the Congress Party led by Captain Amarinder Singh had come to power in the Punjab, there would have been hundreds of historians and bards around to tell tales of the tall Maharaja! In this context, the words of an upright Governor, NV Gadgil - he had ceased to be the Governor of his own accord when he said so - at the convocation of the Punjab University in March 1963 - still ring fresh in my ears, “They (politicians) have made wisdom a by-product of power…” Time, of course, would always be on Atlanta’s heels - my own slipping this year into the venerable group of seniors in the range of the three score plus ten came as a mixed pleasant surprise to me too! 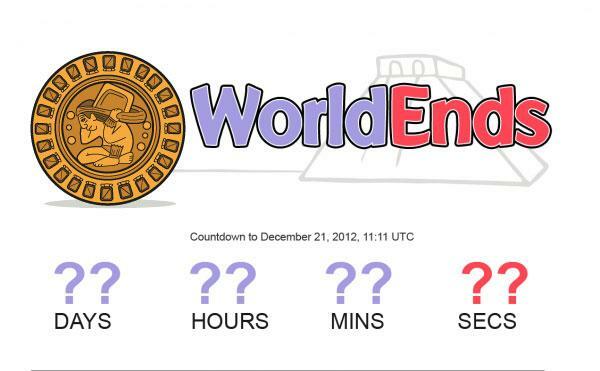 As the count down to the year 2013 C.E. started in earnest, the ‘calendar-cognoscenti’ and ‘Time-Watchers’ had got themselves hooked to the ‘end of the bak’tun, the 5,125-year old ancient calendar of the Maya’. The media and the internet dooms-day-dreamers scattered some fear - and much more fun - that the end of the world is nigh - before the North Pole reached its position furthest from the sun on Friday, 21st December! I was strikingly reminded of 4th of February, 1962 when we - as undergraduate students in the DAV, College, Jalandhar - were witness to an amusing hysteria among many faithful Hindus in Bharat prophesying that a rare constellation of planets was all set to decimate this world, in the Mahaa Pralaya predicted in the scriptures of Jyotish Vidya! Kaalchakra - Wheel of Time - has indeed been a serious subject for the Indian thinkers ‘who evolved, not a linear, but a cyclic theory of time made up of yugas, manvantras, and Kalpas. They were convinced that the universe is without beginning and without end - going on recurrent phases of manifestation and dissolution. According to Vishnu Purana, each yuga-Krita, Treta, Dvaapra and Kali represents a progressive decline in virtue morality, happiness and longevity…The four Yugas constitute the Mahaayuga of 4,320,000 earthly years. Further, one thousand Mahaayugas or 4,320,000,000 earthly years make a Kalpa, a day of Brahma! At the close of this day of Brahma, a collapse of the universe takes place…’At the end of (Brahama’s) night, he awakes and creates anew’! Apart from the ‘fear and fun’ dimension of the Maya calendar which is now behind us, like the 2K terror, another aspect of similar nature about the newly born year pertains to the ‘unlucky’ number 13. The eagerly awaited prestigious annual number of The Economist, ’The World in 2013’ warns against ‘globalization of superstition’. In one if the lead articles, John Grimond explains that while,” Twenty-thirteen: for most people, another year…nothing special... the United Nations says it will be the International Year of Water Co-operation and also the International Year of Quinoa (a plant with edible seeds)” To cater to the hunger of the numerologists, Grimond dishes out that 2013 will be the first year since 1987 to have all digits different from one another. John Grimond further points out that 20 and 13 add up to 33which numerologists– crackpots too-consider a “highly charged master number”, full of meaning. He, however, concedes that for triskaidekaphobiacs- meaning, those afraid of 13-‘the prospect of 2013 is not so much interesting as terrifying.’ Referring to the roots of the fear of 13 in the Christian and Persian historic traditions, the article also points out that ancient Egyptians, Greeks and modern Jews had myths that 13 brings good luck. It is quite clear that both the traditions share complete absence of reason behind their convictions. While musing over the mysteries of the history of measuring the ‘immeasurable’ Time, I am transported to my years in Iran. In 1976, the Iranians awoke one morning to be in the new ‘Gahshumar-ye-Irani’ i.e. the Iranian Calendar System suddenly proclaimed Shahanshahi- Imperial’ replacing suddenly the centuries old Islamic 1355 to 2535, marking the birth of ancient emperor Cyrus as the first day instead of the migration of prophet Mohammad from Mecca to Medina. And within less 1000 days of the change of Calendar, the Shahanshahi Iran had been swept into dustbin of history by the Islamic Revolution of unprecedented global implications. I vividly remember my stroll two decades later in the balcony of a much meager bungalow in the Contadora Island in Panama-His imperial Majesty Aryamehr Mohammad Reza Pahlavi was destined to spend there a few of his last months of life –perhaps, conversing with the waves of the Pacific Ocean! The dethroned and hotly hounded by determined enemies, the once Mighty Monarch might have been wondering over the tyranny of Time-and also over tens of thousands of tyrannical deeds of the SAVAK, his dreaded secret police. It is much gratifying to know that India has been spared any serious controversies of the Calendar kind. The calendar Reform Committee presided over by the noted astro-physicist Meghnad saha attempted to reconcile traditional practices of various ‘desi’ calendars with modern astronomical concepts. A solar month was defined as the interval required for the Sun’s apparent longitude to increase by 30 degree, corresponding to the passage of the Sun through a Zodiacal sign (rashi).The officially introduced at Chaitra 1, 1879 Saka Era on March 22, 1957 calendar has remained confined, in practice, to be legally indicated in the official documents of the Government of India. In the preface to the report of the Calendar Reforms Committee, PM Jawaharlal Nehru had said, “ Now that we have attained independence , it is only desirable that there should be a certain uniformity in the calendar for our civic, social and other purposes and this should be done in a scientific approach to this subject.” The periodic reports in media point out that Sikhism, India’s most dynamic faith, is still to put a final seal on its calendar related issues involving dates of various festivities. Reckoning and reconciling my own calendar issues, I may interestingly state that my date of birth is only an approximate entry by a very wise school teacher. I do remember the first ever news I had listened to on Akash Vaani. It was over a ham radio set in my village contrived by a wireless technician on vacation from army that I could listen amid disturbing noise, "Ceylon ke Pradhan Mantri Senanayke ki ghorhe se gir kar mrityu ho gayee hai…” The google search has now confirmed PM Stephen Senanayke had “suffered a stroke and fell down whilst riding the police mare ’Chitra’…on the morning of 22 March 1952…” I also vividly recall the excitement and a deep sense of accomplishment when as a student of eighth grade, in October 1956, I was selected to speak on 'All India Radio' school broadcast programme. On the children Day function in School on 14th November, I was awarded Rs. 7 and Annas eight paid by the AIR for my two and half minutes speech - Rs. 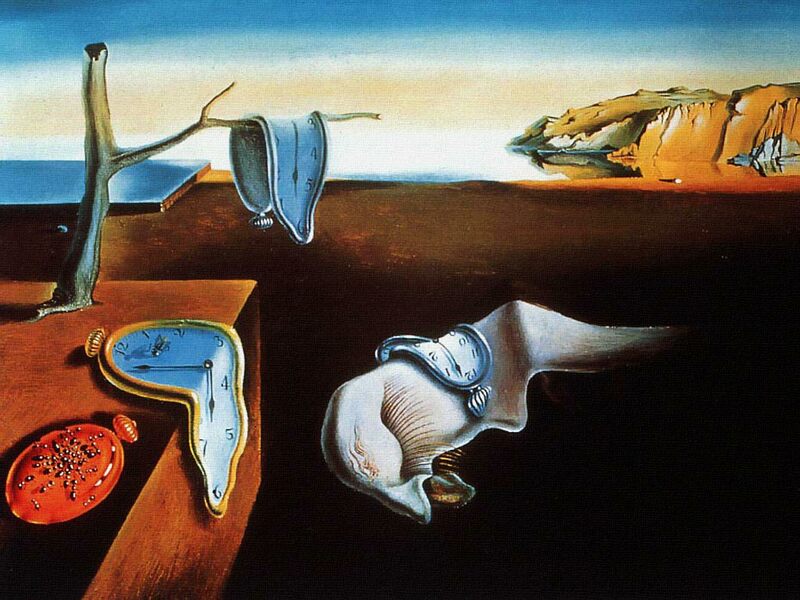 3 per minute appeared indeed a kingly-mind-boggling-sum! Time, I must be telling myself, is indeed money!! While meditating over Time - past, present and future - many, many poetic expressions criss-cross my mind: Time as the invisible but ultimate arbiter of human destiny and Time as a unit of every breath and each beat of the pulse! Time - the eternal traveler; time, the ever present; ever the same; and also never the same!! Cheer, a very happy New Year!!! 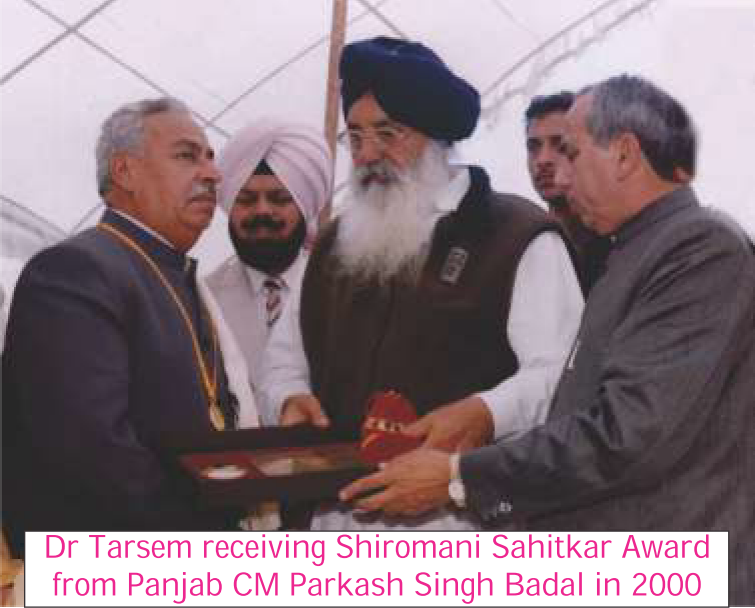 It is, therefore, with a soulful pride that more than 52 years after praying for the guidance by the Divine Light, I am essaying to express my deeply felt thoughts about the resplendent and illuminating personality of Professor Dr S. Tarsem of Malerkotla. He has indeed been for me a personification of a unique human lighthouse in an area of darkness pointed out in the opening paragraph. Dr Tarsem has become an incarnation and a metaphor for super human determination and titanic courage in his epic struggle against the relentless infirmity of visual impairment. He has triumphantly emerged an Olympian hero as the foremost poet, critic and an extraordinary scholar-teacher of Punjabi with an encyclopedic range of knowledge of the world of literature. He intuitively reminds me of the great classical poet-scholar John Milton whose celebrated poem, 'On His Blindness' lights up thousands of 'lamps' of memories among mine and Dr Tarsem's contemporaries when we studied it in our text book of B.A. titled 'Living Lyre', also mentioned by Tarsem in his much celebrated a autobiography, 'Dhritrashtra'. It was September 1984. I was on leave in India from Romania. Punjab was a picture of an uneasy calm and scary confusion in the wake of military action in the Golden Temple, Amritsar. I paid a visit to Govt. College Malerkotla to meet some lecturer friends who had been my colleagues during my own most enjoyable spell as a young lecturer. It was Prof. C.P. Singh of the Dept. of Physics who conjured up an instantaneous poetical session in the lawn near the main entrance. Prof. Tarsem and Prof, Jagdish Mohan Sharma delighted us by reciting their select poetry of Punjabi and Urdu respectively. The next day, I requested an old student friend of mine to record their fine verses for me in my tape recorder. A bond of lasing personal and literary friendship with Dr Tarsem was firmed up soon when he respond-ed, vide his loving letter dated Feb.7,1985, in his touching poetic prose, to my letter of Dec. 25,1984 from Romania. He also forwarded to me his book of stories titled, 'Paatiya Duddh - the Split (spoiled) Milk'. Some of the stories in the collection indeed impressed me for their fresh themes, genuineness of characters and the use of the typically authentic diction of our area of Malwa. Most interestingly, I handed over the recorded cassette of 1984, still in good audio quality, to Dr Tarsem during my long cherished meeting with him at his home in Malerkotla in November 2011 after more than 27 years! He told me that Prof Jagdish Mohan had died many years back and that the cassette might, perhaps, be the only one containing his highly popular satirical poems in his own voice!! agg khani tik ke ouh, behndi nahin hai, dosto! Destruction does not seem to stop, friends! Tusin bhole ho, barhe hi bhole ho; tuhanun pata hi nahin lagan ditta ke kadon Washington te Islamabad da computer tuhadi khoprhi 'ch tika ditta giya; te tusin saare Girjhan di joon vich pai gaye, sappan di joon…hanere di joon pai gaye! It was a touchingly nostalgic experience for me to receive from him, in 1997, when I was in Panama, an anthology titled, 'Aapne Aapne Khambh (Wings of Their Own)' containing the Ghazals by 23 poets of the ilaqa of Malerkotla. The names of Shankar Mubarakpuri (Ambrin uddiie te haase Chhirhkiye /Dharti Phulkari Bana Ke challie); Ram Lal Premi (Ethe tan vasde Sikh jan Hindu jan Musalman / Kitthon milange lok hun Nanak de naal de); ex-MP Bhan Singh Bhaura (Hanjuan sang morhda han viaz apne ishak da / peerh saari umar di lekha chukavan vaaste) and Naaz Bharati (Ai meri ham nafas; zindagi hai kashmakash) transported me to my dream-like days of the school and the circle of the intimate friends of my dervesh Comrade Chacha Shankra Nand Ji. The Sahit Sabhas, local literary associations, were indeed at the best of their creativity and dedication during those 'distant' days! The meticulously researched introduction of the book by Dr Tarsem had introduced me to the promising scholar-critic in him. And then finally I returned as a pensioner of Bharat Sarkar in 2004 after a long innings of 'lying' abroad in the service of the nation. After completing the process of settling down in my new little nest on the bank of legendary Yamuna, I set out seriously to pursue in the sun-set years, 'what I always longed to do but could not do' i.e. to indulge full time, in a disciplined manner, in the pursuit of 'Three R's - reading, reflecting and writing'. Dr Tarsem has been quick to emerge again in my distinct category of those friends who fit into my scheme of things - ham umar, ham safar, ham khyal, ham khwab - same age, same pilgrimage, same thinking, and same dreams. He had been quick to introduce me to the Quarterly, Nazaria - Point of View - the vehicle of high quality literary expressions published under his watchful and benign guidance. All the special issues of Nazaria, I may mention among those on Lal Singh 'Dil'. Prof. Mohan Singh, Faiz, Hasan Manto, must be ranked among the collectors issues for their excellence of literary standard. They invite comparison with similar journals published by institutions with far more resources at their disposal. I have indeed been overwhelmingly impressed by his prolific literary output since his retirement: it is surely an inspiration for me, 'the Niagara of creativity often springs up and rushes forward when you become your own boss, 24x7!' We have further discovered that we, quite surprisingly, have several common inspirational individuals from my uniquely knowledgeable school guru Ashni Kumar, to the teachers'- teacher Prof. Pritam Singh and the poet-philosopher futurologist Krishan Ashant. I was simply amazed by his deeply insightful portrait of Prof. Pritam Singh in Nazaria and he was delighted to publish my review article on Ashant's swan song anthology of poetry, 'Beete nuun Aawaazan - Calling up the Past' and even couple of my personal recent letters to him. The first public event of our literary togetherness was destined to take place in Chandigarh in Oct 2011 when I attended the session of discussion on his recently published monumental book of 496 pages titled, 'Punjabi Ghazal Shastar'. I must admit that having long been a student of the traditional craft, modern practice and the huge popularity of Ghazal in Urdu, Hindi and Punjabi - not to mention English Sonnet - I was genuinely impressed by this detailed compendium of research and critical appraisal of an important genre of oriental poetry. To read the book was a personal voyage of discovery in the evolution of the art of one of the most enduring forms of poetry, particularly in the background of my having lived in Iran, Saudi Arabia and Pakistan where I was privileged to listen to the finest lyricists of the south Asian countries. I had also been fortunate to enjoy an intimate friendship with one of the most respected poet and literary historian, Shri Ali Jawad Zaidi. I am confident that the importance of this scholarly work will be appropriately recognized sooner than later by the relevant institutions in India and Pakistan. Nourishing an ambition - with the usually attendant dreams and night mares- of penning my autography, I have studied Tarsem's two volumes of autobiography, Katchi Mitti Pakka Rang (152 pages) and Dhritrashtar (308 pages), with a much deeper empathy and extra attention. Katchi Mitti first published in 1990 and as a revised edition in 2002, covers the period of the first fifteen and a half years of Tarsem's life. The book captivates the reader with its lyrical and restrained prose style, wit, humor and pathos. The details of childhood and early youth of author's life in a semi-rural area of Malwa region are dramatically unfolded. The chapter, 'Sarbala Banan da Sawad - The Taste of being the Best Man of the Groom'- gives a hilarious account of the pleasures and perils of the marriage as they were solemnized in the romantic era in Punjab when there were no proper roads and the engines of vehicles were also quite moody in functioning. The second volume of the autobiography, 'Dhritrashtra', published in 2009, is dedicated to the loving memory of author's devoted life partner who had passed away, at 49, on the night of the Karuva Chauth, on October 8, 1998. The 40 chapters of this work of Tarsem's mature vintage might be considered highly valuable socio-cultural documents and an authentic running commentary on the cross currents of the happenings in Punjab that shaped the author's life during the five decades since 1958. The book has indeed been of fascinating interest for someone like me who had spent his life during the most of this period in far off lands but had also remained emotionally attached to so many of those very places and people mirrored prominently in this book. Dr Tarsem's intense and never ending struggle in all his life and his shining success indeed make an inspiring saga for all. The blind and visually impaired people have contributed immensely not only in the realm of music and literature of the world, from Homer to Milton to Surdas, but in ever increasing new area of human endeavors in the recent past. Dr Tarsem has been in the forefront in the forums for fighting for the rights of the blind. He has dwelt on his dream-plan to build 'Home for the Old and the Blind' in his Autobiography. The modern medical technologies have certainly scored notable successes in treating the scourge of sightlessness but India has the dubious distinction of having 15 million, with 26 percent being children out of the total of 37 million blind in the world. The national program by the Govt. of India to control blindness expects to reach its blindness elimination target of 0.3 percent by 2015, five years before the WHO deadline of 2020. The shortage of ophthalmologists and optometrists is appalling, just one eye surgeon for 100,000 people! We need many more determined soldiers of Tarsem's caliber and commitment to wage war against blindness in India in terms of cure and care. The elevation - in a geometric progression - of the spiritually inspirational stature of Shri Ravi Dass Ji (Circa 1450-1520) from an initial Bhakata - a devotee/worshipper - in his contemporary and earlier Hindu Brahmanical religious discourses to a Sant - a spiritualist par excellence - in the later medieval period and to an emancipator - Guru / the liberator-teacher - in the more recent epoch of democratically determined ethos indeed represents an arduously marathon and excruciatingly revealing pilgrimage of India's challenging tryst with her complex - Varna Ashram / caste system singed - religious and spiritual identity. The defining departure and the path breaking turning point for the ‘revolutionary re-envisioning’ of Ravi Dass Ji - a spiritual and moral colossus yet an incarnation of humility to the extent of even self-denigration - was, however, the inclusion of his select sublime verses - 40+1 in 16 celebrated classical ragas measures of melodies - in the Adi Granth, compiled in 1604 AD by Shri Guru Arjan Dev ji (1563-1606 AD), the uniquely scholarly and divinely farsighted fifth master who was the first to embrace martyrdom on the altar of the ‘freedom of faith and conscience’ in the evolution of the most distinct tradition of making the supreme sacrifice of in the Sikh faith. The rest, as they say, is the history and the ‘tryst with the societal and spiritual destiny’ of independent India. When introspecting back and forth over the centuries after the decline of Buddhism and the consolidation of the Muslim rule over Delhi and the territories much beyond it in all directions, we find that that the saints of the Bhakti and the Sufi traditions had surged forward to guide the masses amidst the confusion and conflict of moribund Hinduism and aggressive Islam. The spiritual horizons of the entire north-western Bharat were indeed brightened as never before by the several saint–gurus, most of them with the lowly and humble origins according to the so called ‘divinely sanctioned Brahamanical scriptures’. The spiritually most polluted region of Awadh with Benares emerging as the capital of Brahmin ‘Thugs’ plying their nefarious trades by exploiting the names God and the dark deserts of orthodoxy of the kingdoms of Rajputana were indeed dazzled by the songs of light and beauty attributed to the true messengers of humanity, particularly Kabir (C. 1398-1518?) and Ravi Dass. The wandering folk singers were quick to carry far and wide the heart touching Vaani - the verses - of the two inspired masters with abode in Benares, like gentle breezes carry, on their invisible wings, the fragrance to the dark and desolate corners. The inspiration for a just and egalitarian social order in the heart and mind moving poetical narratives of the various eminent saint-poets would seem to have culminated in the concept of Begumpura - The Sorrow-less City - a very earthly abode proclaimed by Ravi Dass Ji. He was loud and clear to announce his project to make God a public wealth, available to all through purity of heart and the simple means of love: “The Lord is no one’s property; to love does the divine monarch yield.” The entire environment of the various places of worship in India becomes full of Divine fragrance when the accomplished musicians sing the Ravi Dass Vaani like the soul stirring song in Sri Raag, “Tohi mohi, mohi tohi; antar kaisa… You and I, I and You - how are we different? Only in the sense that gold differs from the bracelet, and water differs from the wave. If I did not sin, O Eternal Lord, You could not be called Purifier of sin… ” (SGGS P.93 TR. Nirmal Dass). Ravi Dass made a frontal attack on the empty rituals and discriminatory practices which had polluted Hinduism, “Though a man bathe in the pools of all sixty-eight shrines; though a man worship the twelve Lingams; though he dig public wells and create ponds of fresh water - but if he reviles others - all his good deeds shall be utterly wasted….” (SGSS P.875 Tr N. Dass). He indeed struck a strongly original note in his epoch emerging as a practical social-reformer-crusader, addressing, as if, our own time today. No surprise that the people belonging to the toiling and devoted community of Ravi Dass - the oppressively persecuted and systematically marginalized - in the entire Northern India, in the vast and valiant historical Punjab in particular, were to find an eternal fountain of solace, strength and salvation in the dynamic faith based on equality and fraternity formally launched by Shri Guru Gobind Singh Ji in AD 1699. It has been interestingly a combination of several factors - above all the parameters of democratic polity - that the last five decades have witnessed an era of diligent and dedicated research and scholarship to explore more and more original sources and references relating to the non-Brahamanical discourses on spirituality like the Bhakti and Sufi movements. Interestingly, the life and works of Guru Ravi Dass have been subjects of many new learned treatises following the rigors of modern research methodologies and the over all inclusive approach. The universities of the northern states of India would seem to have been vying with each other to establish chairs to promote special studies on the works of low born saint poets. There has been a phenomenal resurgence of resourceful Ravi Dass Deras and they have been very energetic in availing of all the modern popular means of mass media like the audio / videos of the exquisite Vaani sung by distinguished artists apart from bringing out attractive editions in various languages, including in English, for the strong diaspora community, of all the verse attributed to the saint-liberator who had roared about and even celebrated his so called ‘lower class station of caste’. The internet facility with dedicated websites, publications and all the other attendant means have been systematically pressed into service to promote the ideals contained in the verses of the ‘divine teacher.’ The birth day of Guru Ravi Dass - now a closed holiday in several states of India - is celebrated with huge fan fare festivities in the Ravi Dass temples with special gathering in the recently consecrated magnificent Seer Govardhan Temple, the pristine place in the periphery of modern in Varanasi. It is indeed quite interesting and purposeful to examine the various available accounts - unauthentic and unreliable as per the prevailing practice in the medieval times - to elucidate upon the life of Guru Ravi Dass. What can be inferred with certainty is the humble - low caste - birth of Ravi Dass in the vicinity area of present Varanasi and that he followed the family occupation of tanning hides and shoe making. 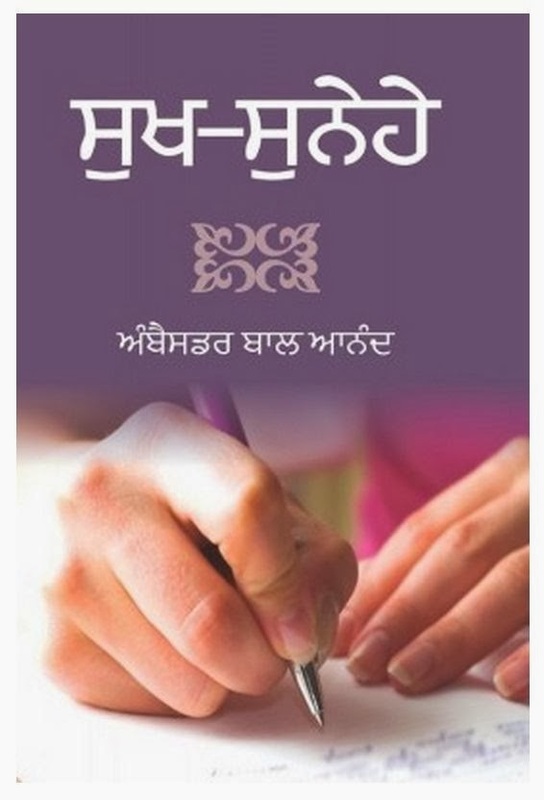 There are several references in the verses by Ravi Dass himself and also by the fourth Guru Ramdas (1531-1581 AD) and the fifth Guru Arjan Dev (1563-1606) indicating his caste as Chamar and occupation of maker of shoes and disposer of carcasses of animals. The verses of other saint poets and later commentators further reveal this reality and also suggest the period of his life. Bhai Gurdas (1551-1629 AD) in his verse compositions called Vaar - ballad - contain important insightful references to Ravi Dass. Among the earlier Punjabi sources, mention may also be made of the Janam Sakhi of Sri Guru Nanak Dev ji by Sodhi Manohar Dass Miharban (1581-1640) - son of Prithi Chand and nephew of Guru Arjan - mentioning how Mardana would sing Pads of the Bhagats, including Ravi Dass, to Nanak. Pothiprembodh (C. 1693 AD) contains accounts of lives of sixteen saints including Ravi Dass. Without fear of failure or fear of loss. O my brother, there is ever lasting well- being there. There none is third or second, all are one. The wealthy dwell in that town. Whoever is my fellow citizen, is my friend.